I've been noticing mushrooms on the forest floor this year. I don't know if the unusually hot weather this summer had something to do with their size or appearance, but the wild mushrooms growing in the woods behind our house seem larger and more colorful than usual. I can't decide if I like the looks of this mushroom or not . . . Is it pretty? Or scary? A sign of healthy soil? Or of creepy, poisonous spores? There. Much better. Now the mushroom looks charming and even useful. 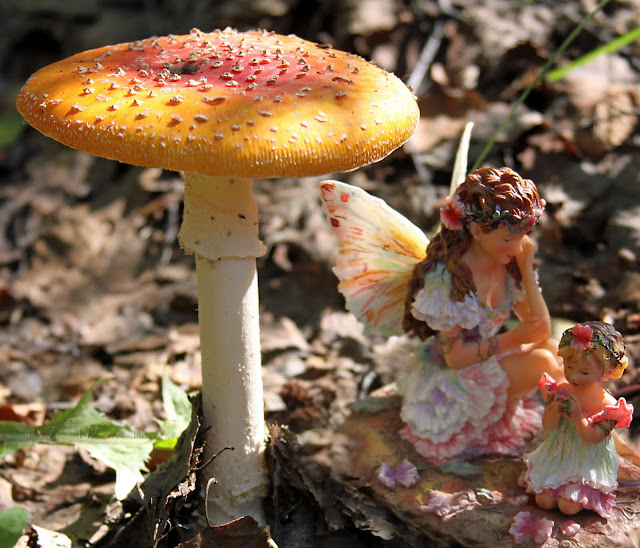 Those little fairies can take shelter under the mushroom when it rains, or sit in its shade when the sun's too hot for their delicate wings. So pleased to have stumbled upon your blog. Hello from England! How absolutely gorgeous! Those mushrooms are amazing. And I LOVE the addition of the fairies. Like the fairies...but I'm with you. Is the mushroom poisonous? I wouldn't trust it! That's actually a beautiful mushroom!! Much prettier than the ones we have in our backyard, which actually look like the kind that you buy in the store and that I've had to smack out of my children's hands before they stuff them in their mouths. The fairies totally make the picture though!!! Very sweet! So pretty! Around here, those are called Death Angel mushrooms. I am not sure of their official name, but they are poisonous..so be careful! You are SUCH a girl momma! Beautiful pictures! I once saw one of those when I vacationed in Alaska. I believe it was near a river just outside of Wasilla. 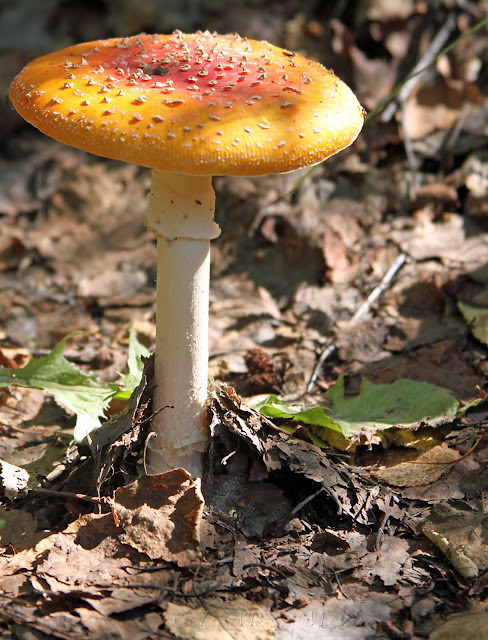 It is definitely of the Amanita variety, and very well may be A. Frostiana as a fellow anon suggested. Although those are usually found more toward the east coast if I recall.